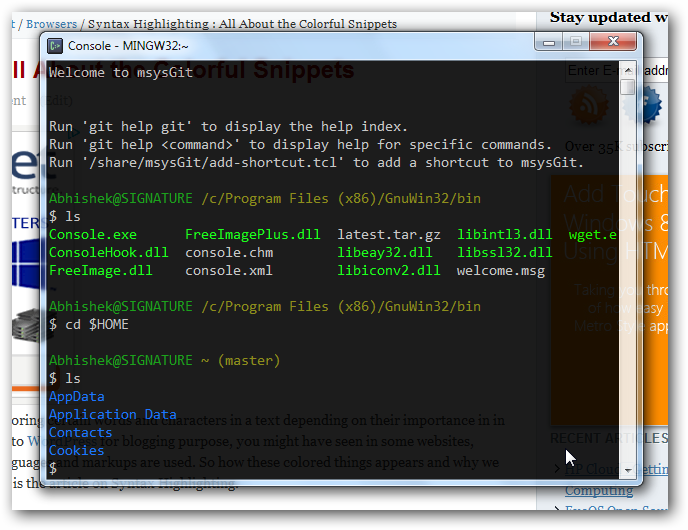 Colored Text with Syntax Highlighting Translucent Console for Windows. That means a Console that gives colorful text, works as SSH Client, Git Bash, do wget etc. Basically there is no meaning of working or thinking for Windows OS, it is better to use Ubuntu 12.04 LTS or a Mac. Still those who are determined to use Windows and uses SSH/Telnet Client, Git Bash, needs many UNIX commands like wget, curl this odd titled article Colored Text with Syntax Highlighting Translucent Console for Windows will make them to feel the power of UNIX like OS. One is a list of Command Prompt Alternative for Windows PC, because that default one is so much beautiful, eyes get blind with its beuty after working for works like the Second example article which is a guide on Installing WordPress on Windows PC using WAMP, where we have used Windows Command Prompt almost like UNIX bash. On the other hand the default ‘text editor’ notepad is so minimalistic that ultimately Gedit needs to be installed. cd $HOME gvim .bash_profile set -o vi alias ls='ls --color ' alias cp='cp -i ' alias mv='mv -i ' alias rm='rm -i ' alias vi='gvim ' alias vip='gvim ~/.bash_profile &amp; ' alias sop='. 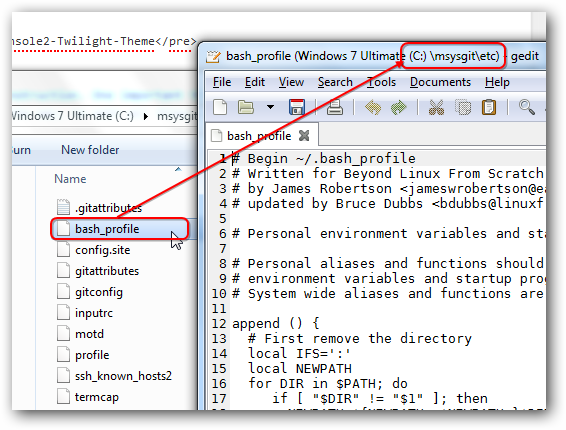 ~/.bash_profile ' alias mys='mysql -uroot -p ' PATH=$PATH:"/path/to/mysql/bin"
Change the path of MySQL for your setup. With gvim .bash_profile command Vim text editor with GUI (of 20 years back) will open. If you use vi then it will open the command line tool. This Article Has Been Shared 9944 Times! Installing cURL in Windows to Run cURL Commands Natively is actually quite easy process,a starter might find it difficult. 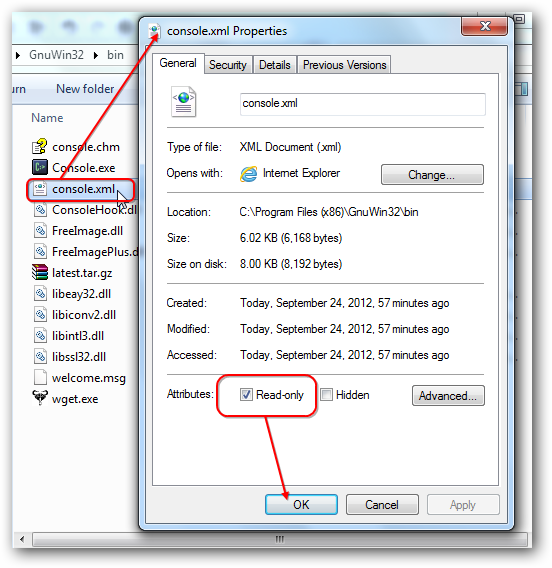 Here is Guide to run cURL in Windows. 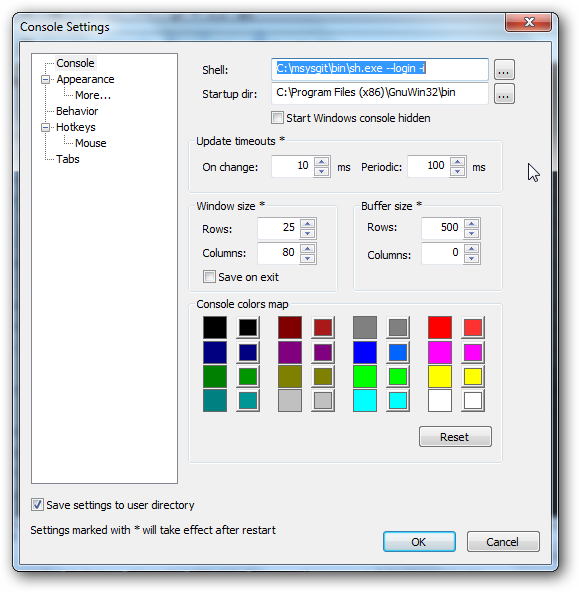 Cite this article as: Abhishek Ghosh, "Colored Text with Syntax Highlighting Translucent Console for Windows," in The Customize Windows, September 23, 2012, April 21, 2019, https://thecustomizewindows.com/2012/09/colored-text-with-syntax-highlighting-translucent-console-for-windows/.